Central Bank Governor, Mr. Godwin Emefiele has said that he would be leaving as a satisfied man at the expiration of his tenure in June 2019. 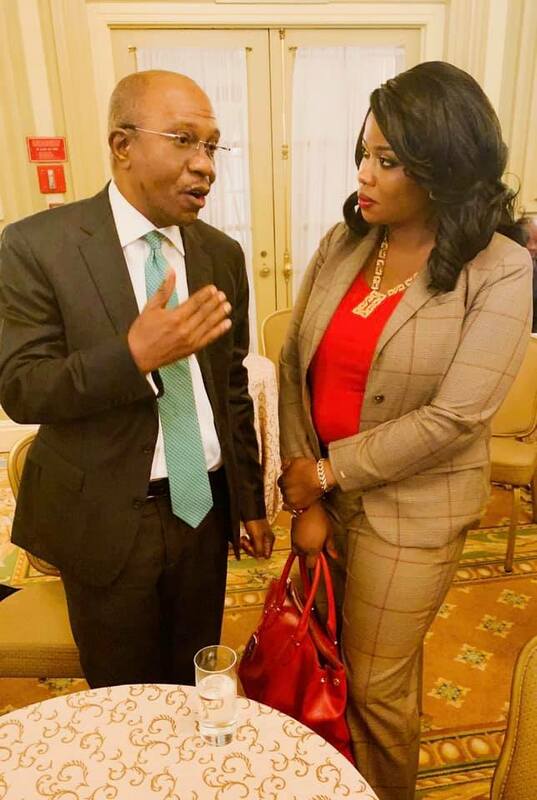 Mr Emefiele spoke with U.S based Political Journalist , Joi John during his visit to Washington D.C where he attended the 2019 Spring meetings of the World Bank/IMF. Joi John reports on Facebook. "...I attended an event in honor of Nigeria’s Central Bank Governor, Mr. Godwin Emefiele at The Willard Intercontinental Hotel in Washington D.C.
Emefiele is up for retirement in June. He told me he would be leaving satisfied knowing that he did his best. I remember when Emefiele assumed office in 2014, he promised to run a central bank that would spend its energies on building a resilient financial system to serve Nigeria’s growth and development needs. Under his leadership at the CBN in the last five years, several reforms have been implemented to salvage the Nigerian economy. At the expiration of his tenure as Governor, Emefiele’s footprints will be visible in various aspects of development finance, foreign exchange management, financial inclusion and our payments system." Gbam!! !He didn't do well at all. Another Hausa appointment in the waiting. Immediatetly you leave one aboki will take over.